Notes: Once upon a time czg has released his abandoned levels source files. I looked through them and found the beginning of E1M1 remix level. I liked it and started continuing it together with czg. In result you can see this collaborative level. You can find the full story of development in the corresponding txt file. Also, in the zip file you’ll find .map sources released under GNU Public License. Have fun! 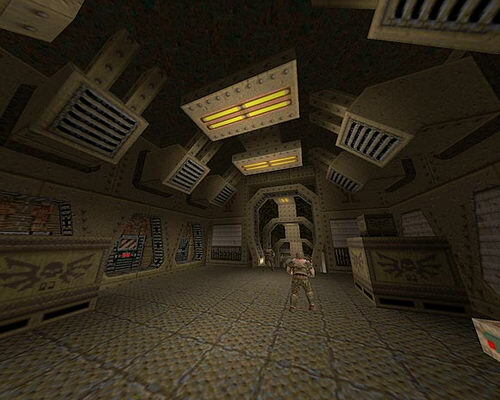 inertia – Old school meets new school, this is the definitive interpretive quake mappery, taking our nastalgia for the (g)olden days and refining it to a higher level. pushplay – That was like some weird alternate universe. It felt strangely uncomfortable. windlash – Beautiful level and great level of new detail (and atmosphere) brought to E1M1. aguirRe – Great architecture and lighting created a completely different feel to this classic map. Scragbait – It’s so cool to know the layout in advance yet it looked so much different! Excellent experience. Mr Fribbles – Download this, there is coolness inside (and outside). Kell – This map rocks so much it actually makes me like idbase. Entries (RSS) and Comments (RSS). 43 queries.